Picture - VF-21 F11F-1 Tigers in left echelon formation. The Grumman F11F/F-11 Tiger was a single-seat carrier-based United States Navy fighter aircraft in operation during the 1950s and 1960s. Originally designated the F11F Tiger in April 1955 under the pre-1962 Navy designation system, it was redesignated as F-11 Tiger under the 1962 United States Tri-Service aircraft designation system. The F11F/F-11 was used by the Blue Angels flight team from 1957 to 1969. Grumman Aircraft Corporation made about 200 Tigers, with last delivered 23 January 1959. The F11F (F-11) Tiger origins can be traced back to a privately funded 1952 Grumman concept to modernize the F9F-6/7 Cougar by implementing the area rule and other advances. This Grumman company project was known as the G-98, and by the end had departed totally from the Cougar. The design's potential for supersonic performance and reduced transonic drag stirred interest in the Navy. By 1953, redesigns led to a completely new aircraft bearing no more than a familial resemblance to the Cougar. The new wing had full-span leading edge slats and trailing edge flap with roll control achieved using spoilers rather than traditional ailerons. For storage on aircraft carriers, the F-11 Tiger's wings manually folded downwards. Anticipating supersonic performance, the tailplane was all-moving. The aircraft was designed for the Wright J65 turbojet, a license-built version of the Armstrong Siddeley Sapphire. The Navy Bureau of Aeronautics was sufficiently impressed to order two prototypes, designated XF9F-8 even though the new fighter was clearly a new design. To add to the confusion, the prototypes were then redesignated XF9F-9 with the XF9F-8 designation going to another more straightforward Cougar derivative. Since the afterburning version of the J65 was not ready, the first prototype flew on 30 July 1954 with a non-afterburning engine. In spite of this, the aircraft nearly reached Mach 1 in its maiden flight. The second prototype, equipped with the afterburning engine, became the second supersonic US Navy aircraft, the first being the Douglas F4D Skyray. In April 1955, the aircraft received the new designation F11F-1 (F-11A after adoption of the unified Tri-Service naming system in 1962). Carrier trials started on 4 April 1956 when an F11F-1 Tiger landed on and launched from USS Forrestal. The F-11 Tiger is noted for being the first jet aircraft to shoot itself down. On 21 September 1956, during a test firing of its 20 mm (.79 in) cannons, pilot Tom Attridge fired two bursts mid-way through a shallow dive. As the velocity and trajectory of the cannon rounds decayed, they ultimately crossed paths with the Tiger as it continued its descent, disabling it and forcing Attridge to crash land the aircraft; he survived. Picture - An F11F-1F "Super Tiger" prototype, with the General Electric J79-GE-3A engine, in 1956. In addition to the F-11A (F11F-1) fighter, Grumman also proposed a more advanced version of the airframe known as the F11F-1F Super Tiger. This was the result of a 1955 study to fit the new General Electric J79 engine into the F-11 airframe. The Navy was sufficiently interested to authorize modification of two production F11F-1s with enlarged air intakes and YJ79-GE-3 turbojets, with the result being designated the F11F-1F, indicating a production F11F-1 with a special engine fit. The aircraft first flew on 25 May 1956, reaching Mach 1.44 in one of the flights. After addition of 60� wing root fillets, a 13.5 in (35 cm) fuselage extension, and an uprated J79 engine, F11F-1F reached an impressive Mach 2.04 and an altitude of 80,250 ft (24,466 m). However, the U.S. Navy did not order it into production. Failing to secure the Navy contract, Grumman marketed the Super Tiger to foreign customers. The Super Tiger outperformed the Saab Draken, Lockheed F-104 Starfighter, Dassault Mirage III and Fiat G.91 in a tender to equip the Swiss Air Force; the Mirage III was finally chosen as a cheaper and more secure alternative, yet a close second performance wise. The German Luftwaffe, Japan Air Self Defence Force and Royal Canadian Air Force showed considerable interest but eventually the Lockheed F-104 Starfighter was chosen. This outcome, however, was marred by the Lockheed bribery scandals, in which huge sums were paid to influential politicians in those countries to ensure the adoption of the Starfighter. 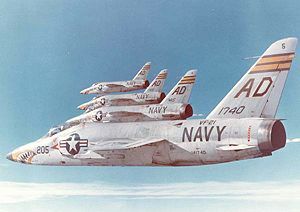 Seven U.S. Navy squadrons flew the F11F-1: VF-21 and VF-33 in the Atlantic Fleet and VA-156 (redesignated VF-111 in January 1959), VF-24 (redesignated VF-211 in March 1959), VF-51, VF-121, and VF-191 in the Pacific Fleet. In service, the Tiger operated from the carriers USS Ranger, Intrepid, Hancock, Bon Homme Richard, Forrestal, and Saratoga. 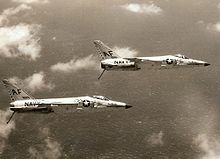 The F11F's career only lasted four years because its performance was inferior to the Vought F-8 Crusader and the J65 engine proved unreliable. Also, the range and endurance of the Tiger was found to be inadequate. Thus, the Navy cancelled all orders for the F11F-1P reconnaissance version and only 199 F11F-1 (F-11A) fighters were built. The aircraft was withdrawn from carrier operations by 1961. It continued in service, however, in the training command in south Texas, Beeville and Kingsville, until the late 1960s. Students performed advanced jet training in the F-9 Cougar, and upon completing that syllabus, were given a brief taste of supersonic capability before transitioning to fleet fighters. While the F-11's fighter career was short, the Blue Angels performed in these aircraft from 1957 until 1969, when the Tiger was replaced by the McDonnell Douglas F-4 Phantom II. Picture - VF-33 Tigers from USS Intrepid in 1959. YF9F-9 Original designation. F11F-1 Single-seat fighter version for the U.S. Navy, re-designated F-11A in 1962. 199 built and later production aircraft had a longer nose. One was used for static test and a further production of 231 aircraft cancelled. F11F-1P designation of a Navy photo reconnaissance version, 85 were cancelled. F11F-1F Super Tiger F11F-1 fitted with the J79-GE-3A engine, two built. F11F-2 Intended designation of the production F11F-1F. Data from Bowers 1990, p. 257. Rockets: Aero 6A or Aero 7A "Rocket Package"
Andrade, John. U.S.Military Aircraft Designations and Serials since 1909. Hinckley, Leicestershire, UK: Midland Counties Publications, 1979. ISBN 0-904597-22-9. Bowers, Peter M. United States Navy Aircraft since 1911. Annapolis, Maryland: Naval Institute Press, 1990, pp. 183-185. ISBN 0-87021-792-5. Crosby, Francis. Fighter Aircraft. London: Lorenz Books, 2002. ISBN 0-75480-990-0. "Naval Aircraft: Tiger." Naval Aviation News (U.S. Navy) , September 1973, pp. 21-22. Thruelsen, Richard. The Grumman Story. New York: Praeger Publishers, Inc., 1976. ISBN 0-275542-60-2. Grumman F-11 Tiger Pictures and Grumman F-11 Tiger for Sale.